Taking care of your eyes includes coming in for a comprehensive eye exam every one to three years. 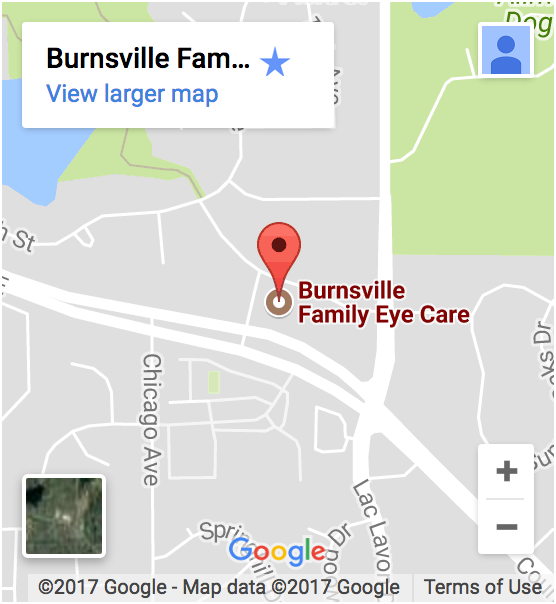 At Burnsville Family Eye Care an eye exam includes more than just reading off an eye chart. The eye doctor will assess your eyes for refractive errors to determine whether you need a prescription for corrective lenses like contact lenses or eyeglasses. However, the eye exam incorporates other components of vision and eye health assessment, such as testing binocular vision, peripheral vision, and observing the eyes and retina using a slit lamp and / or a retinoscope. We also screen for eye conditions and eye diseases. Dr. Mattson provides comprehensive eye exams for patients of all ages. The way an eye exam is carried out may be altered to suit the needs of the patient. If you need an eye exam Savage, MN is only 10 minutes from our Office, and once you are coming, you may as well bring the whole family along. Our highly trained staff would be happy to assist you in booking your appointments one after another to accommodate your group. Walk-ins are welcome as well.